d12 Pages of Awesome Returns! 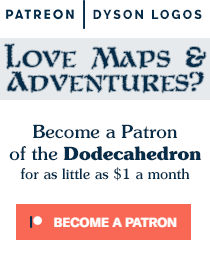 Dodecahedron Issue 5! Somehow I forgot all about the old Dodecahedron ‘zine when I compiled my list of ongoing projects. And to be honest, I’d pretty much dropped the idea of going back to publishing my 12-page zine in favor of putting work into the blog and publishing the finished works in a commercial format. But then I started working on these monster character classes (I’ll post the final versions of the centaur and goblin classes later this week)… and I realized that this is exactly the kind of material that the Dodecahedron was made for. But before I could start working on an issue with monster classes, I really needed to finish off Issue 5 – part two of Erdea Manor. Since the material for Issue 5 was written in December, it was about damned time I put it together into the zine in addition to the blog and of course Dyson’s Delves (that’s right – if you want Erdea Manor in print, you have two choices now – you can print out the two issues of the zine, or you can pick up a copy of Dyson’s Delves which has it along with a few other adventures from the history of the blog and a pile of maps). So yeah – click on the picture above or this link right here to download the latest issue of Dyson’s Dodecahedron – back from the dead after 2 full years out of production! Thank you for re-animating the Dodecaheron (I love that word). I think they’re brilliant little zines.